Strictly statistics part 2 – is the scoring system a bit rum-ba?! The most I’ve seen of Strictly Come Dancing is the end credits as I tune in ready for Doctor Who. But, as I’ve posted before, the judges’ scores do make for an interesting data source. However, it’s not all about the judges opinions. The public votes too. And, it seems, the public (in its social media guise) thinks the public (in its voting guise) got it wrong. Helen and Georgia faced the dance-off, with Georgia surviving. Helen had been fifth in the judges’ scores. But Georgia joint second. In the last six weeks, Georgia has bested Helen’s score five times. So Helen might reasonably have expected to lose out to her, and not feel too sore. But might Helen have felt she had better chances against Anita, the last placed of the surviving contestants? The dance-off is, after all, decided by the judges. 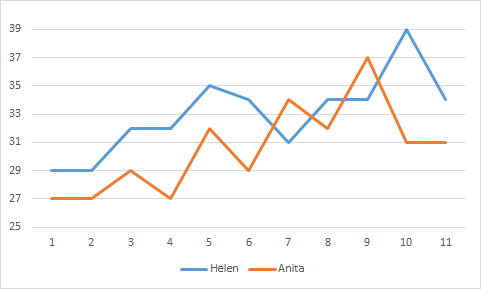 So, let’s look at past performance: might Helen have fared better or worse than Anita in the judges’ choices? In the first six weeks, Helen always had a higher score than Anita. Since then, Helen had a higher score three times; Anita, twice. It seems Helen would have good cause to think that out of the two, she would have survived. Of course, Anita might have hoped to pip Helen given that she’s been improving over the later weeks. Let’s dig a bit deeper and look at the judges’ individual decisions. No week has seen a ‘split decision’; that is, where at least one judge has favoured Helen and one other has gone for Anita. This suggests that if favouritism exists of judges for contestants it is small. Other than where judged equal, Helen has won a judge’s mind nine times, whereas Anita has done so five times. Again, this suggests that Helen is the better dancer out of the two. So, Helen’s departure does seem rooted in how the public votes led to Anita being saved. Although probably destined to lose to Georgia, she would have had a solid chance against Anita. One thing that strikes me is how the scoring system works, converting judges’ scores and the public’s votes to two ranking positions which determine how many points are then awarded. I’m not sure that it’s particularly fit for purpose. You might even say, it’s a bit rum-ba! NB I’ve taken the scores from the fascinating ultimatelystrictly.com web site. Any errors are due to me. Next Next post: Charity spend – a more-than-average sting in the tale!